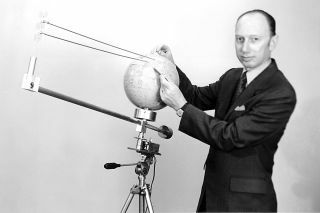 Peter Glaser, the father of the solar power satellite concept. Peter Glaser, a space pioneer who introduced the idea of using satellites to beam solar energy from space down to Earth, has died at the age of 90. Over the decades, the novel technology Glaser envisioned has been known by many names — space-based solar power (SBSP), solar-power satellites or satellite power system (SPS), as well as satellite solar-power system (SSPS). An imaginative inventor, Glaser died May 29 at his home in Lexington, Massachusetts. In July 1971, while working for the consulting firm Arthur D. Little, Inc. in Cambridge, Massachusetts, Glaser filed for a U.S. patent for his "Method and Apparatus for Converting Solar Radiation to Electrical Power." Glaser envisioned harvesting solar radiation in space using satellites, which would convert it to microwave energy and then transmit it to Earth for use in electrical power systems. He obtained the patent in 1973. In fostering the idea, Glaser drew upon his extensive expertise in space science and technology, solar energy conversion and wireless power transmission. He later became a vocal advocate of solar power satellite systems as a solution to the growing global energy dilemma. This writer had the privilege of working with Glaser from the 1970s into the mid-1980s, while assisting in a detailed appraisal of SPS by the U.S. Department of Energy and its Office of Energy Research's Satellite Power System Project Office in Washington, D.C.
An artist's illustration of a possible space solar power collector. Prior to his notoriety as "father of the solar-power satellite," Glaser was project manager for the Apollo 11 Lunar Ranging Retroreflector Array installed on the moon's surface in July 1969, and two other arrays installed during follow-on Apollo landing missions. Glaser also was responsible for the Lunar Heat Flow Probes and the Lunar Gravimeter used in the Apollo program. In 1986, an experiment designed by Glaser was also flown aboard NASA's space shuttle Columbia to investigate gravitational effects on human blood cells. The MIT Institute Archives and Special Collections in 2004 processed 96 boxes of historical material, from 1944-2000, donated by Glaser. Drawing from U.S. Patent depicting Peter Glaser’s satellite-based method for converting solar radiation to electrical power. "Glaser was a gentleman, soldier, scientist and visionary," said John Mankins, President of Artemis Innovation Management Solutions LLC and author of "The Case for Space Solar Power," newly published by the Virginia Edition Publishing Company. "The other night I happened to see an older episode of the popular TV program 'The Big Bang Theory' in which the main characters spend the first part of the story measuring the distance from Earth to moon by bouncing a laser — supposedly transmitted from the roof of their apartment building — off Dr. Glaser's reflector. I don't know if he ever saw the program, but I think Peter would have been delighted," Mankins told Space.com. "Glaser generously introduced me to the concept of the solar power satellite, in the mid-1990s, and welcomed me into that community," he added. Even in the 1960s, Mankins said, Glaser's vision of the future was one of both risk and opportunity — the risk that civilization might not act in time to develop the new energy sources that would be needed when fossil fuels eventually run out, and the opportunity to assure the future of humanity through innovations such as space solar power. "Peter Glaser will be deeply missed, but his contributions never forgotten," Mankins said. Leonard David has been reporting on the space industry for more than five decades. He is former director of research for the National Commission on Space and is co-author of Buzz Aldrin's new book "Mission to Mars – My Vision for Space Exploration" published by National Geographic. Follow us @Spacedotcom, Facebook and Google+. Originally published on Space.com.